Since I know that 2 hours is pretty much the maximum time that I can spend out at my property without getting overwhelmed, I had one goal in mind for Saturday. Take down the dog runs and bring them back to the house to sell. Turns out that even that was too much. After taking down one dog run, I was hot, sweaty and tired. It is getting too hot to work outside. I am going to have to start getting up early on Saturday. How I wish I had 3 day weekend again like at my old job. Well, my goal is to have a more flexible part time job so if I just hang in there, I will have more days to sleep in. 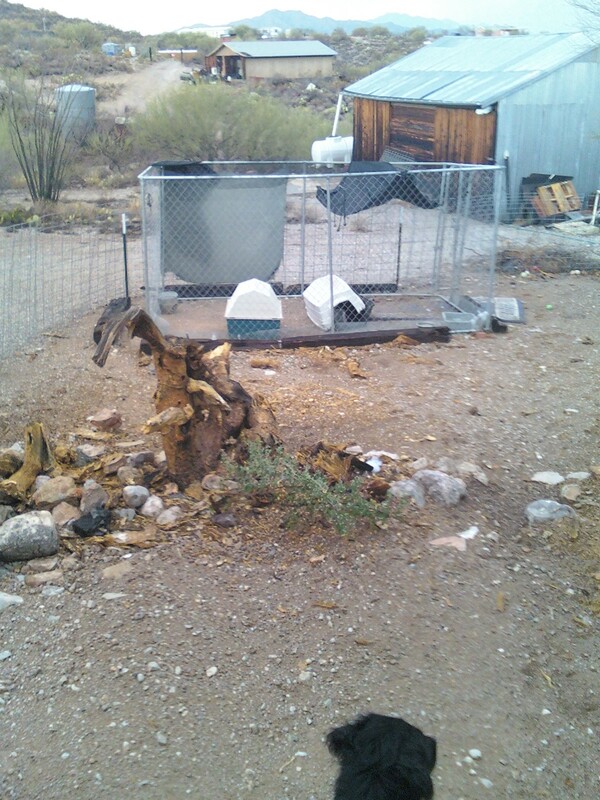 The dog run came down without too much problem. The big problem was the dead rat in the storage space of my RV. I should have expected it really, After all, I did put poison out for it. It was quite stinky and gross to clean up. The smell should go away soon. That's one good thing about the dry heat. It will bake it until there is no smell left. The other dog run will have to wait a couple of weeks. I listed the first dog run on craig's list and immediately got 3 people who wanted to pay less and one person who offered payments. Good thing I listed it for more than I expected to get. I'm sure I will settle for one of their offers in the next few days. My goal is to use this money to sign up for an online course on how to set up an online store/business. I need help with all of the details. I feel like my progress is going painfully slow but any progress is good so I will just keep making mini-goals and completing them and I will get closer to my giant goal. Exactly! And it is a BIG elephant. You've inspired me, Daizy! I have a huge attic/garage/yard/fence project that I keep putting off to some imaginary perfect 3-day-weekend. It is overwhelming and nothing has been accomplished on it in more than a year. Now thanks to you and your Mini Goals post, I have a new approach: I'm going to work on it for 2 hours every Saturday. That's it. What gets done gets done, and the rest will have to wait until the following Saturday's 2 hour allotment. I figure it's about a 30 hour job, so I should have it all wrapped up by mid-August -- which will be sooner than if I keep putting it off! Thanks and here's to your next Mini Goal! Well, Lee, I'm glad I am inspiring. Waiting for the perfect weekend will certainly end in disappointment. I had 2 three day weekends over Spring break and a months worth of chores planned for them. That's a sure-fire way to feel like a failure.